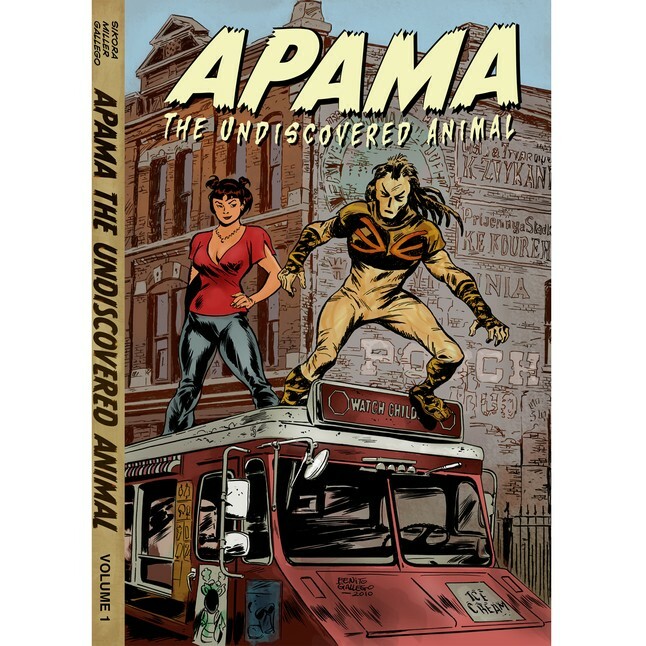 Pullbox Reviews: Apama – The Undiscovered Animal TPB – Indie Awesomeness! Apama Volume 1 (180 Page Hardcover) is a collection of issues 1 through 5 of the ongoing comic book series Apama the Undiscovered Animal. It features four complete stories—The Origin of Apama; his inaugural donnybrook with the landscaper-gone-to-seed known as the Lawnmower Man; the two-part tale of terror which brings our hero face-to-face with The Million Year Hunger; and wraps up with the first appearance of a the brown and tan avenger’s pscho-delic nemesis, Regina! Not only does the collection contain five full issues, it’s loaded with bonus material in the form of pinups, essays, ‘making the page,’ and more. I love capes as much as the next geek, and I have digested more superhero stories in the last 30 years than what is considered normal and probably healthy. And after pondering about all the good and bad that I have read, what I can say is that Apama is truly something special – an identifiable post-modern superhero that has a unique voice and without the normal trappings… no trust funds, no genius IQ, no unlimited tech, no UN of superhero buddies… just hope, an ancient quest and some dumb luck. At first glance, Apama and his origins seems very traditional Saturday morning – lliya Zjarsky, your everyman millennial who is struggling to maintain a job, find rent money and keep his waitress girlfriend happy (without giving up too much “me” time) is out on a hike and he follows a ghost warrior to an ancient cave where he finds a magic scroll and costume that eventually grant him the powers of the Apama (The most powerful beast in all of creation, who went into seclusion after defeating every other animal in combat… obviously). Although the origin seems like it might fit in with a big comic publisher’s landscape, it is told through a slightly tilted lens. Iliya doesn’t necessarily want to be a hero, but he does want to have purpose and do what is right. He is a great relatable protagonist that is written with enough skill and wit (Thank you Mr. Sikora and Mr. Miller) that he is surrealistically believable, endearing and entertaining. The world of Apama is offbeat, and at times absurd and silly, but it is always recognizable. The reader wants to be there and wants to explore. Recently, Diamond Previews Guide compared the character and the writing to that of the Coen Brother and the Dude in the Big Lebowski – there couldn’t be a better comparison. The art feels, in every good way, very old school. While the visuals scream “fantasy”, the story is kept clean and clear. Artist Benito Gallego does an amazing job of visually bringing Apama and the cast of characters of the Apama-verse to life – not just in his character design (again, a perfect blend of believable but not too shiny) but in his story telling layout – he has frames and action that break their edges and overlap each other on the page – exemplifying action with losing any plot. While I have seen it multiple times, it has been a few years since the first time I watched Hero Tomorrow, the iconic modern indie superhero film that introduced Apama to the world. I’’ve said it before and I will say it again, while unconventional , Hero Tomorrow is in the top five best superhero movies of the last decade. If you haven’t see it, it is worth your time and money! Bottom Line: Overall, this creative team has created an exemplar of what a modern indie super hero is. Christmas is coming – anyone even slightly leaning “geek” will love this TPB!